YOUNGSTOWN, Ohio – After a veteran has served his country, he might need a hand-up. Some veterans may be leaving the service without a job waiting for them, a stable place to live or some might require special resources. Combat veterans, for instance, often need resources to help cope with the psychological and physical problems that many experience after being deployed. There are many opportunities for local veterans with a variety of organizations that help with everything from employment to education. Sometimes they just need a listening ear from a fellow vet they may meet at any number of private organizations in the area such as the Veterans of Foreign Wars or the American Legion. Whatever help veterans may require, there are plenty of resources throughout the area to satisfy their needs. Many returning vets are looking to continue their education and have excellent opportunities awaiting them at Youngstown State University. 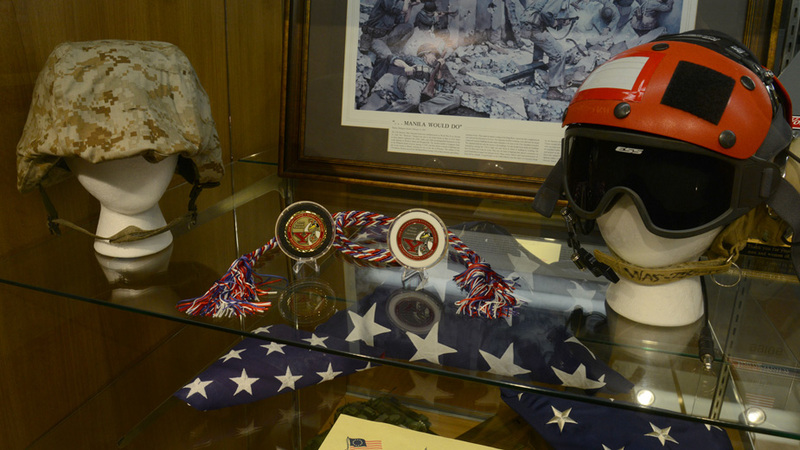 An average of 350 veterans attend YSU each year, with about 80 graduating each of the last three years, he adds. Pictured: Upon graduation, the Veteran’s Cord and Coin is given to each veteran by Rick Williams, manager of the Veterans Resource Center and Office of Veterans Affairs at YSU. Some find work with veteran-friendly and veteran-owned businesses while finishing an education. “I currently have two employees, one is a Marine who is a YSU student and the other an Army veteran who is about to start a training program for CNC machining,” says George McDonnell, owner of Team Vets Cleaning Service in Boardman. McDonnell started his cleaning service in 2016 and is a 22-year veteran of the U.S. Navy. He started his business with the goal of employing military veterans. McDonnell’s clients include Prima Health Care, General Motors, American National University and The Agent Insurance. “I use the Ohio OneStop and Mahoning County Veterans Service Commission to reach out to veterans when I need to hire,” says McDonnell. For some veterans, however, going directly to work can be a challenge, especially for the disabled. “I assist program-eligible veterans with significant barriers to employment,” says Dave Oesch, a disabled veteran outreach program specialist with the state of Ohio. The Ohio Department of Jobs and Family Services program for disabled veterans provides one-on-one assistance with career guidance, job referrals, interview preparation and job development. Veterans can get information about military-friendly employers, job fairs and more. “I also serve part time with Columbiana County as a Veterans Service Office Commissioner,” says Oesch. But for those veterans without limitations, they may just need a hand getting a job. Susan Krawchyk, executive director of the Mahoning County Veterans Service Commission, lists Ohio Means Jobs as one of the agencies that her commission works with to provide job opportunities for area vets. “We have a great working relationship with many agencies and businesses in the Valley, primarily the VA Outpatient Clinic on Belmont Avenue, the Area Agency on Aging, Adult Protective Services, Mahoning County Job and Family Services, the Youngstown Air Reserve Base and the Carl A. Nunziato Veterans Resource Center at Youngstown State University,” says Krawchyk. The state-funded Ohio Means Jobs has a program just for veterans. The program includes a military skills translator, licensing and certification, free college credit for military experience and a list of military-friendly employers. The commission, funded by Mahoning County property taxes, assists area veterans and their families with filing claims to the Department of Veterans Affairs for service connected compensation, non service pension, education benefits, assisting with VA Home Loans, obtaining their discharge papers, awards and decorations, nursing home and assisted living outreach and transportation to Wade Park VA hospital in Cleveland. “The number of veterans that we serve in the Valley is quite difficult to track, but we serve between 2,000 and 3,000 veterans per year, for either our county benefits or VA benefits,” says Krawchyk. For some vets, they just want the company of other veterans in a comfortable, familiar setting to hang out in such as the local American Legion. The American Legion has 11 chapters in the Youngstown area. The legion is the nation’s largest wartime veteran’s service organization and is committed to mentoring youth and sponsors wholesome programs for the community. For those who qualify, there are 13 chapters of the Veterans of Foreign Wars in the area. The VFW is a nonprofit organization comprised of eligible veterans and military service members from the active, guard and reserve forces. Pictured at top: Retired Army Major Rick Williams is the manager of the Carl A. Nunziato Veterans Resource Center and Office of Veterans Affairs at Youngstown State University.